This week we had the final excursion of our semester. Huh, sounds really depressing when I write it down but it's the truth. The semester really is almost over. 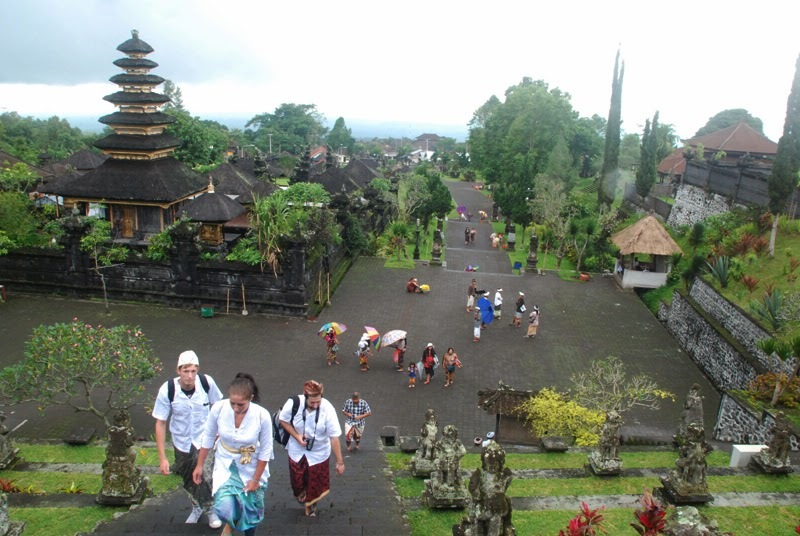 Luckily there's still one more week to go and before that we had a great final excursion that was maybe the best one of them all :) This time we visited Besakih Temple which is the biggest temple of Bali and it's located really near to Mount Agung which is the biggest volcano (and mountain) of Bali. Agung has a really important role for the religional culture of Bali: even some of the beds in Balinese houses may be directed towards Agung. 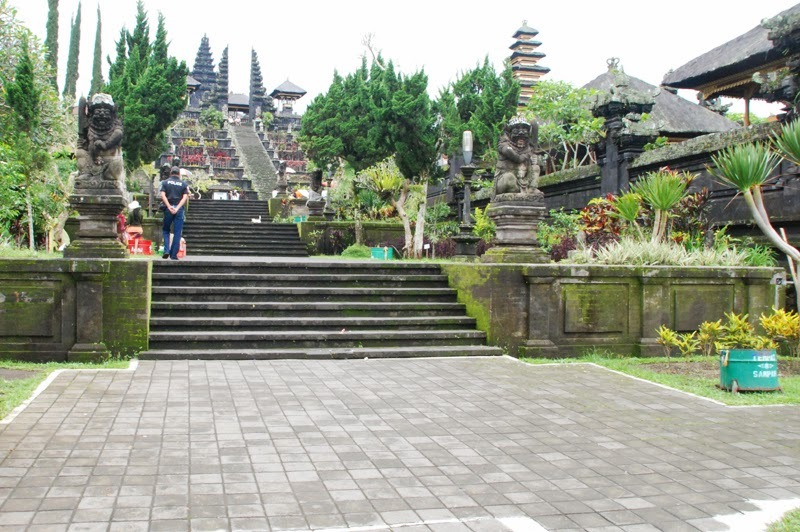 So it's no surprise that Besakih Temple (located in the slope of Agung) which is hundreds of years old is a really important place for Balinese culture and religion. In overall there's thousands of temples in Bali but most of them are small house temples. Besakih is something completely different. Besakih ja Agung are located quite near to the north-east coast of Bali so the trip from Denpasar to there takes two to three hours. Hence our excursion started already at 8AM when we hopped on to our bus and started traveling towards the temple. We were at the destination about 11AM. Right after we had arrived, the whole exchange student group had to change their clothing. You can enter the temple only in a clothing that respects the Balinese Hinduism so everyone dressed up their Balinese traditional clothing that they had purchased during a traditional costume workshop in the beginning of October. Men and women have a different kind of clothes when they're wearing a traditional Balinese costume. Men have a udeng (a headdress), a safari (a shirt), sarong (a large piece of colourful material wrapped around the body like a skirt) and a saput (another skirt which is placed in front of the sarong). Women doesn't wear udeng but instead of that they wear a kebaya (a blouse), a selendang (a scarf that is wrapped around a kebaya) and a sarong without a saput. I'd say that our group of exchange students look really different compared to a normal day at the campus area. After entering the temple area we had a great opportunity to take part of a Hinduism praying ceremony. That was a great experience which I'm probably not getting ever again at least any time soon. Before the ceremony started, every one of us got an incense and a kind of a praying item made of palm leaves and containing different kinds of flowers. When the ceremony (lead by a local priest) began, whole group sat down to a ground. With the instruction of the priest we were praying while holding all the different kind of flowers. In the end we drank and washed our head with a holy water and then the priest put some kind of special rise to our forehead. After that the ceremony was over, in overall it maybe took 15 minutes. In overall this is a really fascinating tradition and the local people really take part of this kind of ceremonies every day so these really are a big part of their everyday life. This is also really different compared to most of the western religion traditions.